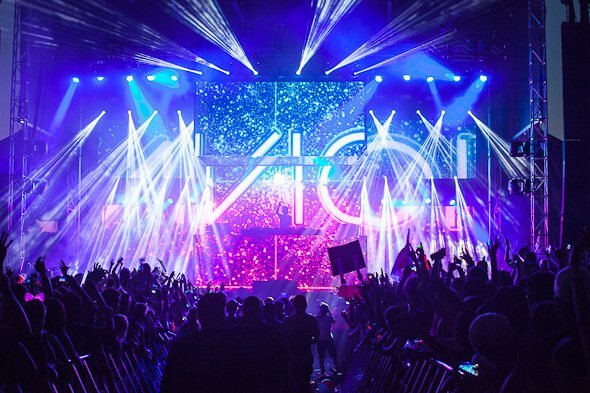 This past weekend, Toronto played host to one of the largest EDM festivals that the country has ever seen. Over the span of two days (August 4th and 5th), twenty five thousand people congregated in Downsview Park for the VELD Music Festival. Headlined by Avicii and Deadmau5, the festival featured a number of the world’s top DJs, spread across multiple stages, in what was one of the hottest parties of the summer. Being my first music festival, I wasn’t too sure what to expect as I walked through the front gates on day one, but as I walked through those exact same gates at the end of day two, I felt that my near $200 ticket was money very, very well spent. Read on as we take you though both days of the festival. Day one began at noon on the main stage and at 1:00 on the secondary stage, which was housed in the Bacardi tent. The layout was simple enough and getting from one stage to another took a matter of minutes. Washrooms, food stands, merchandise shops and other miscellaneous vendors filled the upper half of the park, which is also where the Bacardi tent was placed. On the lower level sat the main stage. Though overpriced concessions, poorly kept washrooms and other staples of any type of festival were all present, I was there for the music and thus, spent most of my time in the crowd, only exiting for a necessary washroom break or to grab a quick bite to eat. After taking a quick look through the line-up for both stages (main and secondary), I figured that most of my time would be spent down by main, seeing as it had a more appealing group of DJs playing. Don’t get me wrong, I’m not bashing any of the DJs that played in the Bacardi tent, they’re all very talented individuals but seeing as I couldn’t be in two places at once, I chose to go see the DJs that I’m familiar with and know better. I did pop into the Bacardi tent on occasion though and from what I saw, the group of musicians playing the stage in there were putting on quite the show. Among those in the line-up on the secondary stage were Tommy Trash, Kill The Noise and Gareth Emery, among others. But, if we’re being honest, most people came to the festival to see the big guns and the first big name to hop on stage on day one was Mr. Steve Aoki. As the hot summer sun started to weaken (though not nearly enough), and Steve made his appearance on the main stage around 5:30, the park began to fill up significantly. It was clear that a lot of people had just arrived. Running through hits like No Beef, Turbulence, Pursuit of Happiness and more, the hour long set included all of Aoki’s usual antics, including crowd surfing on an inflatable boat and showering us in champagne. Though the humid, 30 degrees temperature brought out the sweat in all of us as we danced our hearts away, Aoki kept the crowd pumped and excited. Then again, seeing as this was an EDM festival, it’s not like people were wearing much clothing to begin with. Neon coloured t-shirts, revealing bikinis, fluorescent sunglasses, headbands, glowsticks and some very creative costume pieces made up the attire for most of the crowd. Being the performer he is, Aoki really brought out a good vibe. Though we’d been warmed up by other DJs earlier in the day, such as Chris Lake, Michael Woods, Deniz Koyu and Flipside, I feel as if the party really began with Aoki. It was clear that the atmosphere significantly changed when he came on as Aoki’s stage presence is just a step above the rest. Moving on, after Aoki was Knife Party and after them, Steve Angello (aka one third of Swedish House Mafia). At around 8:00, when Angello was halfway through his set, festival-goers finally saw signs of relief as the clouds opened up and down came the rain, which actually made the party a whole lot better, as did the confetti that Angello exploded onto the crowd. Admittedly, neither of the acts quite lived up to Aoki (though Angello did impress on more than one occasion and I did enjoy his performance a lot), but that’s fine. The crowd was already amped up and the music was enough to carry them to 9:00, when the main event took the stage. Deadmau5, or as some people know him, Joel Zimmerman, walked on stage to an absolutely ecstatic crowd. Though it was now dark out, and rain began to fall from the sky, the excitement and energy that ran through the park as Ghosts N Stuff came on was indescribable. Things didn’t slow down there though, the 31 year old DJ pushed on perfectly and seamlessly with hits like The Veldt, Strobe, Aural Psynapse and more, all while being backed by an absolutely dazzling light show. Jumping and dancing to the beats, absolutely care-free and without a worry in the world, the crowd fully embraced Mr. Zimmerman, despite his lack of an encore. Combined with the rain shower and the stunning lights, Deadmau5’s heavy beats pouring out of the speakers created a sense of euphoria that most in the crowd felt. As Toronto embraced their native DJ with open arms, Joel exited the stage to heavy chants of his name. Hands down, he had won over the entire park. With fans eating out of his hand, screaming for more, he departed the impressive stage as the audience headed out of the venue, eager to see what day two would bring. Click below to continue reading about day two.